The connection that the impressive Victorian house in this photograph has with Harry Price's most famous investigation, the haunting of Borley Rectory, would appear at first to be difficult to establish. In fact it has an incredibly important role in the Borley story as it was here that the foundations of much of the popular background to the case were laid down. 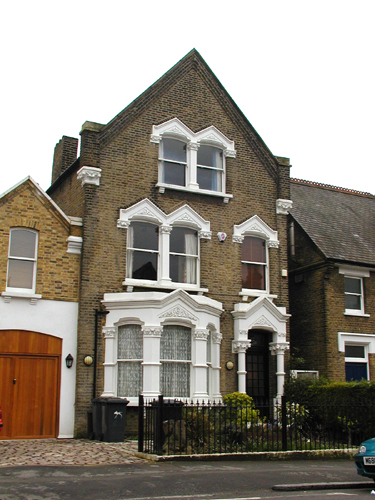 This is the house in Lewin Road, Streatham in South London where Sidney H. Glanville and his family carried out planchette sittings during the time of the Price Tenancy of Borley between May 1937 and May 1938. Sidney Glanville was one of the most important members of Harry Price's rota of 'Official Observers' and spent a great deal of time on the Borley investigation, during the year that Price was the tenant as well as in the years that followed. For more information on Glanville's role at Borley see Absolute Integrity - Sidney Glanville at Borley. Sidney Glanville, together with his son Roger, held table-tipping sessions at Borley, often in the company of fellow observer Mark Kerr-Pearse. Glanville's daughter Helen, later Mrs. Carter, used a planchette at their Streatham home, the communications being recorded on rolls of wallpaper. It was here that the supposed identity of the murdered French nun 'Maire Lairre' was revealed, as well as the famous 'Sunex Amures' message of March 27th, 1938 that the Rectory would burn down that night, pre-dating the actual event by eleven months, although official views tend to associate the blaze to the hand of the then owner Captain Gregson rather than those of the ghostly 'Sunex'! - Gregson's insurance claim was repudiated by his insurers and he was forced to settle to a much lesser sum out of court. Harry Price made much use of the information from the Borley séances as well as those from Lewin Road, Streatham in his books on the Borley case and detailed transcriptions of the sittings with analysis can be found in the late Ivan Banks' book The Enigma of Borley Rectory (Foulsham, 1996). Grateful thanks go to Frederick Brazil for this photograph of an important, but much ignored, part of the Borley case.